Dateline Zurich: 12th International Olive Congress Zurich Olive Oil Awards were announced in late April and we are please to announce that we have six of the selections in stock. The Zurich Awards are very selective, with only five (5) Gold Awards granted. Of the five, two were Italian oils — but other “sibling” selections from producers whose oil we carry at Olio2go. Those were selections from the producers, Titone and Cetrone. Zurich granted eight (8) Silver and 16 Awards. We have Silver and Award winners in stock (if we could, we would rename “Awards” as Bronze). All of these selections are from Sicily! Certainly, Frantoi Cutrera has some magic in winning awards. You will find their oils on may award lists. We recommend the Tasting Set Sampler or the full Connoisseur’s Set. The full Zurich Awards list can be seen here. 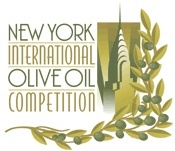 The premier New York International Olive Oil Competition was a great success with three days of speakers and the culminating awards ceremony for top extra virgin olive oils. Kudos to the folks at Olive Oil Times for their new event. It is always fun to attend an olive oil event, and we enjoy the casual, in the hallway, meetings for what one can continue to learn about the world of olive oil. The presentations included formal tastings, discussions on price and value, the pride of countries (notably Spain and Italy), international agreements, and olive oil frontiers (olive oil in India). When the awards were announced, Italy led the pack in the number of total medals! We currently have several of the award winners, with more enroute across the Atlantic. The full list of awards can be seen here. 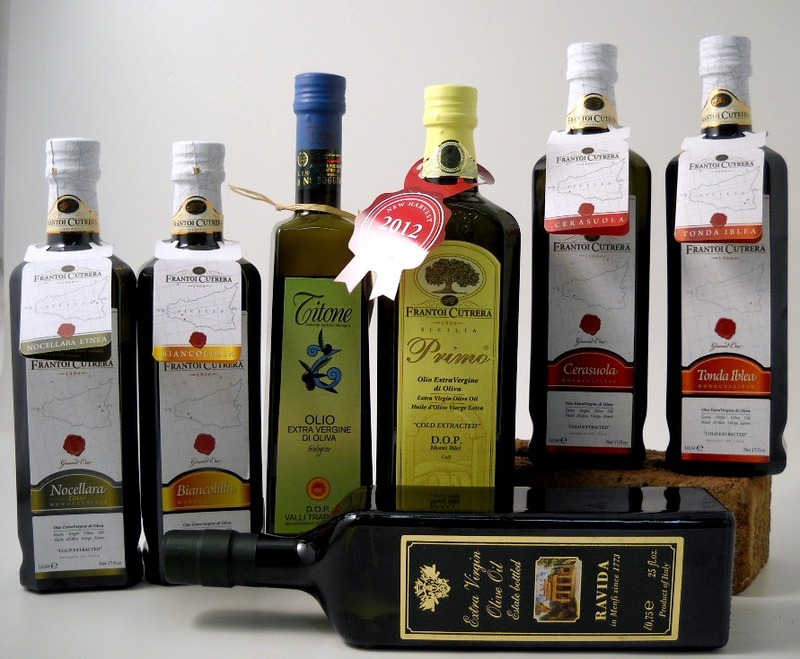 Let’s take a look at a great olive oil label and a great olive oil! 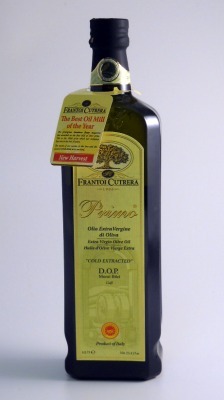 This is Primo Olio Extra Vergine di Oliva (Extra Virgin Olive Oil), and the label indicates that Frantoi Cutrera has been producing olive oil since 1906. The producer is Frantoi Cutrera and the brand is Primo. And on the bottle, the label is written in Italian, English, and French, for sales within the European Union and English speaking countries. Let’s analyze this bottle from the very well regarded Frantoi Cutrera. The hanging neck tag is the first feature to attract your attention, right? Red catches your eye to emphasize that this is the new harvest oil and that Frantoi Cutrera has been named the Best Oil Mill of the Year, by the notable guide, Gambero Rosso. This is the 100th prize received by Frantoi Cutrera. On the back of the tag, there’s an extensive list of 40 awards received in the past 9 years! Cutrera has designed a signature bottle with Frantoi Cutrera pressed into the glass. That’s unique in our line. The orange and yellow symbol is the EU’s symbol of authenticity, Denominazione d’Origine Protetta (DOP, also called PDO in Europe). There are approximately 30 DOP regions for Italian olive oil. On this bottle, the designation is noted as D.O.P. 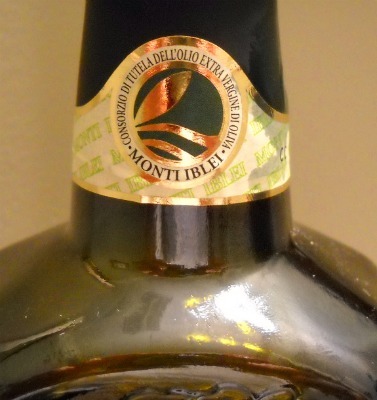 Monti Iblei Gulfi, and the corresponding green and gold neckband signifies the Consorzio di Tutela Dell’Olio Extra Vergine di Oliva – certifying the oil as DOP to the consortium’s regional standards. (Until recent years, the DOP symbol was blue and yellow). This area is in southeastern Sicily. Each DOP region has its own standard reflecting the best qualities of the customs of the region. For this region, the certified oil must have a free fatty acid level no greater than 0.5% and the polyphenol levels must be greater than 150 ppm. Certified oils from this region must also be 90% or greater from Tonda Iblea variety olives. The neck tag has a traceable number that is specific to each bottle. For this bottle, the number is CC 900234. Below the DOP symbol, it is noted as a Product of Italy. Product of Italy– of course, but don’t read too much into it. (Unfortunately, oil delivered to Italy by tanker, and bottled in Italy, will also say Product of Italy). Here the DOP symbol provides assurances that the olives were grown, pressed and bottled in a very small geographic area, what we might recognize as the size of a county, or perhaps, Rhode Island. This label also indicates “cold extracted”. Cold pressed is becoming a misnomer, as the extraction process has transitioned from stone pressing in an open environment to centrifugal crushing in a closed system. The process is monitored so the heat from friction is kept at a minimum. If excessive heat is involved, the acidity level rises. With extra virgin olive oil, the lower the acidity level the better. The international standard is for the acidity level to be below 0.8%. 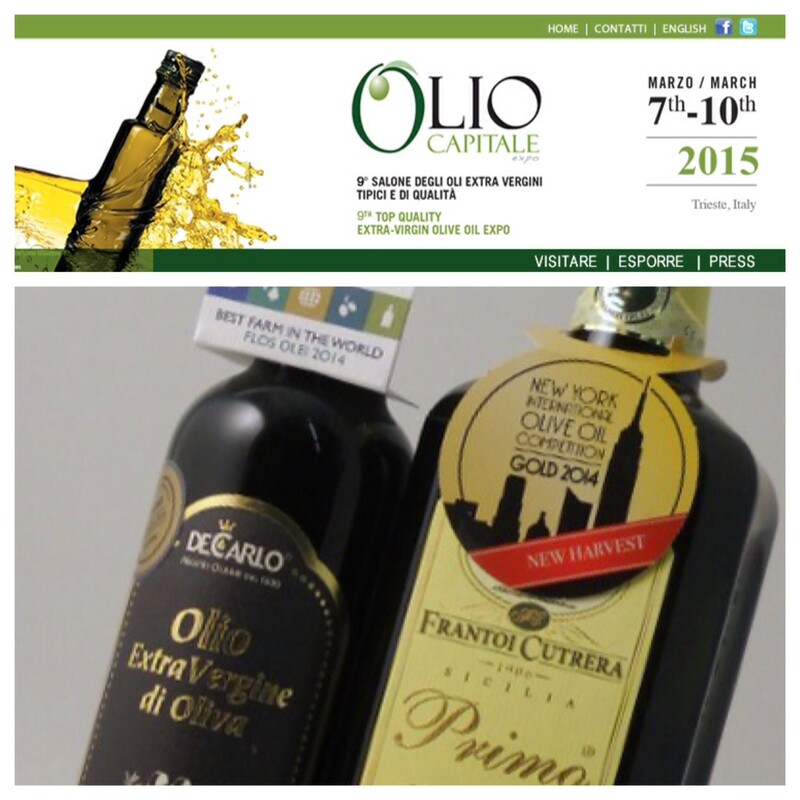 Top quality premium extra virgin oils such as Primo have levels below 0.25%. At the lower edge of the front label, the volume is denoted with 0.75 Liters on the left (noted with the EU “e”) and 25.4 fluid ounces on the lower right edge. 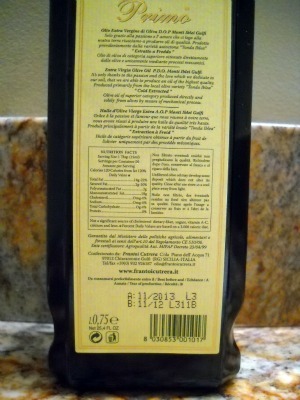 The back label includes more details on this oil, as well as the FDA – required nutrition facts. In this case, the back label notes that the oil is produced primarily from the local olive variety “Tonda Iblea” and that it is produced directly and solely from olives by means of mechanical process. (Lower grades of olive oil are produced by chemical extraction with solvents. Those lower grades are pure, light, olive oil, pomace). As you continue to read the label you will find details on the regulations for certification within Italy. The business address, web address, telephone number, and email address are also noted on the label. There’s no hiding where this oil originated! Lastly, we need to look at the product dating and numbering. Lot numbers are required by the FDA. 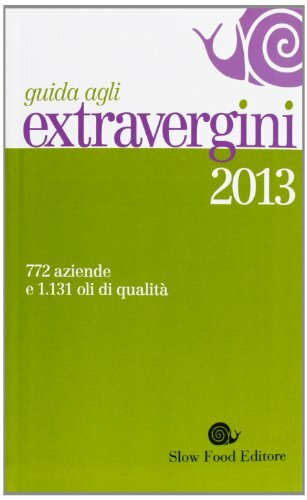 Exceeding this requirement, Cutrera has chosen to indicate the harvest year and best-by date. We support producers who adhere to these higher standards. A further note on bottle dates: We track these very carefully. Occasionally, there will be a late bottling of oil. Let’s say there’s a 2010 oil bottled (from tank to bottle) in mid 2011. That producer can place a best-by date of mid 2013 on the label. To us, that’s still a 2010 oil, not to be sold past December 2012. With careful inventory controls, we sell out long before that date. Our employees often take these bottles home, and top quality oils that have been well stored are full of flavor beyond those printed dates. But we don’t sell them to you. 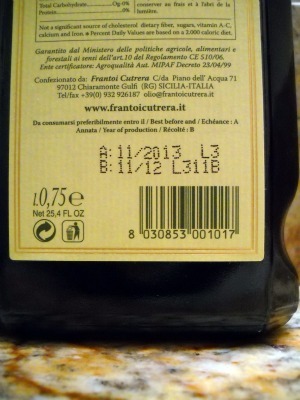 Look carefully at the picture and you will see this is a 2011 harvest oil (noted as 11/12) with a best by date of November 2013. This bottle, sealed in Italy, arrives at your table with the same authentic integrity that it possessed when it left Frantoi Cutrera. The labeling carries forth the authenticity. But what can you learn about the characteristics of Cutrera Selections? We enthusiastically invite you to visit our description and give them a try! To get the freshest Italian Extra Virgin Olive Oil, buy from a retailer who imports often, and warehouses well. Olio2go’s extra virgin olive oil is stored in the dark, in the box, in a temperature-controlled warehouse. Choose a vendor/retailer with strict quality controls and good inventory systems.